On December 7th TechInput senior management attended Moscow Translators Club conference (MPK-9). 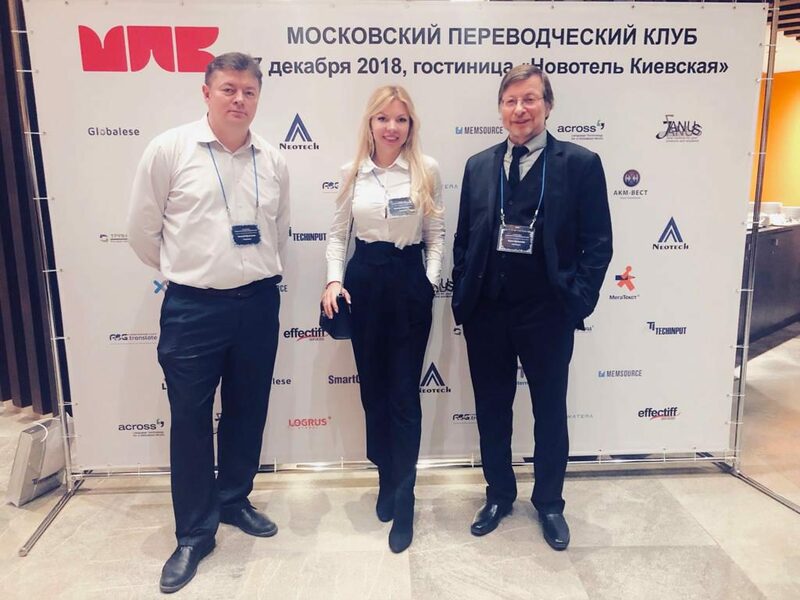 The company’s delegation included Boris Aronstein, President of TechInput Group; Svetlana Ostapenko, TechInput Director-General and Evgeniy Melnikov, Operations Manager. The event targets all participants of translation industry – clients, translation companies’ owners, managers and employees, freelancers. In the course of the conference a number of issues important to translation industry were discussed, such as quality of neural network machine translation, mergers and acquisitions as means for centralizing the market, new approaches to automating work of project managers and vendor-managers, new offers on the VRI market. On the sidelines Boris Aronstein, President of TechInput Group, spoke to Commonsence Advisory analytical bureau founder and general strategist Donald DePalma, who was also key speaker at the event. During a session dedicated to MPK awards Boris Aronstein presented his new book of translations from Welsh poet Dylan Thomas. The book is titled “Word and Sound” and is dedicated to the 20th anniversary of the Group. A copy of the book was presented to each of the twelve MPK participating members. Sector – oriented events like this present not only a chance to exchange experience and discuss common problems, but also a unique opportunity to set tendencies for further industry development.